The Yacht was Built for $120,000 in 1926! The Ida May was built for an absurd price of $120,000. 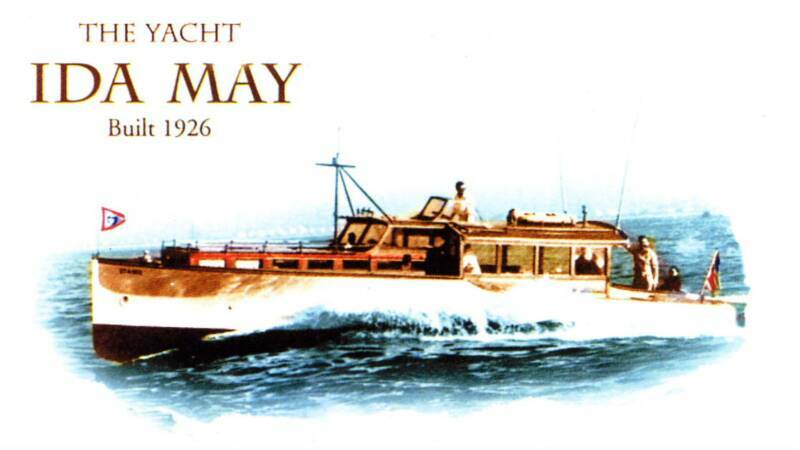 She was known to be the most expensive sportfisher ever built in 1926. Comparable boats of this size were built for under $14,000 in 1926. This was a shocking amount for 1926 and could only be built by an eccentric and exceedingly wealthy man. Indeed, Willard Van Brunt (first owner and designer of the Ida May), was one of the most affluent men in the United States. The Ida May was triple-planked and reinforced with an exceptional hull design with a majestic and handsome flair of the bow. The relative value of $120,000 in 1926 compared to today would be $6,114,546.06. Interestingly and on another note, Willard Van Brunt purchased a champion hunting dog in St. Louis, MO for $300 in 1879. This is today equivalent to spending $66,367.42 for a dog! How could Van Brunt afford to spend this much? Van Brunt was a multi-millionaire previous to becoming a President of John Deere Van Brunt and Company. Van Brunt obtained over $3,200,000 in cash and stock in 1910 for the consolidation of his company with John Deere. This is equivalent to $1,229,926,391.38 today! Van Brunt's Deere stock at least tripled in value by the time he passed. He sold his interest in 1917 when he retired and moved to California. Most of this money was donated to multiple charities and organizations. Indeed, Van Brunt was a venerable Industrialist and Benefactor and his benefaction is well documented in American history. 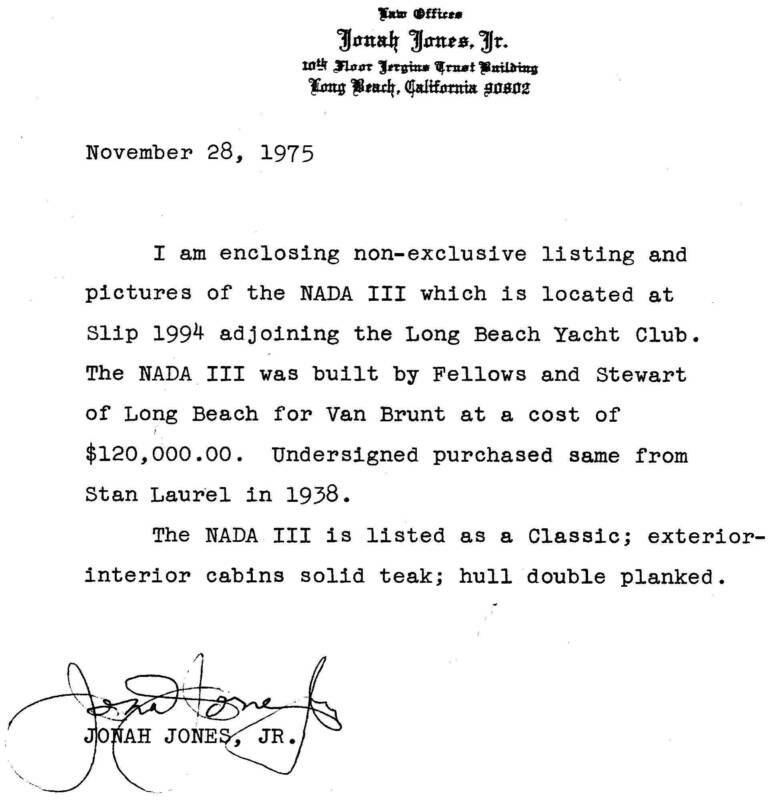 Below is a letter drafted by the third owner of the Ida May (Nada III), Jonah Jones Jr., (1901-1976) placing the yacht for sale. Jones purchased the yacht from Stan Laurel in 1938. Jones was an attorney for Howard Hughes and many other celebrities. He also developed the major Oil and Gas Laws for California. Additionally, Jones owned a significant portion of oil land on Signal Hill which is still considered one of the largest producers of oil in the United States. Needless to say Jones was also a multi-millionaire many times over. His family still owns oil rights in southern California today.